It is no secret that slot machines account for more gambling revenue to casinos than any other game type. We know this, we accept it and we play anyways. Slots are endearing in that way. They don’t try to hide the fact that they are pure, unadulterated gambling; they embrace it. Plus, slots require no great mental effort and offer the biggest jackpots in the casino. Slot machines offer a simple deal to all comers. Any given slot machine will probably just take some of your money, but it might also pay you a life-changing jackpot. Certain progressive jackpot slots may even turn you into an instant millionaire. As public annual revenue reports indicate, plenty of people are more than happy to take that deal. As long as you keep it under control, there’s nothing wrong with throwing a little cash at the old one-armed bandit for a chance at riches. However, not all slot machines were created equal. Payout rates vary from one slots game to the next and have a huge impact on your long term return. While some machines are known to return as much as much as $0.98 for every dollar wagered, others return a measly $0.75 for every dollar wagered. Payout rates, return to player and payback percentage are all terms that refer to the same thing: how much of each dollar wagered is returned to players in the form of prizes. If a slot machine advertises a 90% payout rate, that means $0.90 of every $1.00 wagered is returned to players as cash prizes. Another way to look at it is that if you were to bring $100 with you to the casino and play all of it at a 90% payback slot game, you would expect to end up with an average of $90 remaining after feeding all $100 through the machine. Payout rates are just an average calculated over the long run. Feeding $100 worth of coins through a slot machine does not guarantee that you will end up with exactly $90 every time. In fact, you will rarely end up with exactly $90 after a single session. Instead, you might end up with $98, $79 or even $12,520.83. The payout rate simply takes the results of thousands of spins and comes to an average by dividing the total dollar amount paid out over that period by the total dollar amount paid in over that same period. To use a simplified example, let’s pretend we were to look at a single slot machine in Las Vegas and find that it took in exactly $1,000,000 worth of wagers over the course of a year. That same year, that machine paid out $900,000 in prizes. To find the payout rate, we would divide $900,000 by $1,000,000 and end up with 0.9. Move the decimal two places to the right and we end up with a payout rate of 90%. In this hypothetical example, it does not mean that every gambler in Las Vegas who paid in $100 ended up with $90 worth of prizes. What it means is most players ended up either winning or losing just a little bit. A few players lost more than average while a few players won way more than average after hitting large jackpots. In the end, it all averaged out to a 90% payout rate that year. One thing that you should always keep in mind is that large jackpots skew the average payout rate upwards. If most people play a particular game and achieve 88% payout rates and just one or two lucky gamblers hit six figure jackpots, it will skew the reported payout rate upwards above 88%. Slot machines are highly volatile casino games. Think about how the average session goes: a whole lot of losing spins interspersed with the occasional small, medium or large jackpot. To use a hypothetical scenario, you could watch 10 players at the casino all play slots for an hour. Nine of those players might be down varying amounts while the 10th player is lucky enough to hit a huge jackpot. Even though 9 players lost money, that 10th player’s jackpot raised the average payout rate for everyone. This is worth noting when choosing which slots games to play. A progressive jackpot machine may advertise a 90% payout rate, but that rate is skewed thanks to the one or two players per year who end up catching $1,000,000+ jackpots. If the payout rate is your sole basis for deciding which slots to play, you may want to avoid the progressive jackpot machines. The odds are pretty darned high that you won’t be one of the few lucky players to trigger the progressive jackpot. Thus, your real world return will likely be lower than the advertised payout rate. However, that’s not to say theoretical payout rates are bogus. Your odds of winning the big jackpot are the same as anyone else. If you play any game long enough, your actual payout rate will eventually match the theoretical payout rate. It will just take you longer, on average, to reach the theoretical payout rate due to the rarity of those mega jackpots. Many slot machines have extra features such as bonus games and enhanced jackpots that are only available when you wager the maximum number of coins each spin. Wagering additional coins does increase the payout rate, but that doesn’t necessarily mean it is always a good idea to play the maximum. Remember, the increase in the payout rate is only realized when you hit those big jackpots. Play long enough and you will indeed eventually hit those jackpots. It is more important that you plan a budget every time you play and stick with wagering amounts that fit your bankroll. It is not worth it to double or triple your risk-per-spin if you can’t afford it just for a small increase in your long term win rate. The obvious takeaway from everything discussed up to this point is that slots with higher payout rates are more desirable than slots with lower payout rates. What isn’t as obvious is how that actually affects you in real world terms. Let’s say you are in Las Vegas with $100 in your pocket budgeted for slots. You plan on either spending all of it or going home with a big jackpot. This is money you set aside just for slots and therefore don’t care if you lose it all. You just want to have fun and make that money last as long as possible. Now, let’s pretend you find a slot machine with a 90% payout rate and decide to wager $1.00 per spin. Let’s also pretend you can spin the reels 10 times per minute or 600 times per hour. 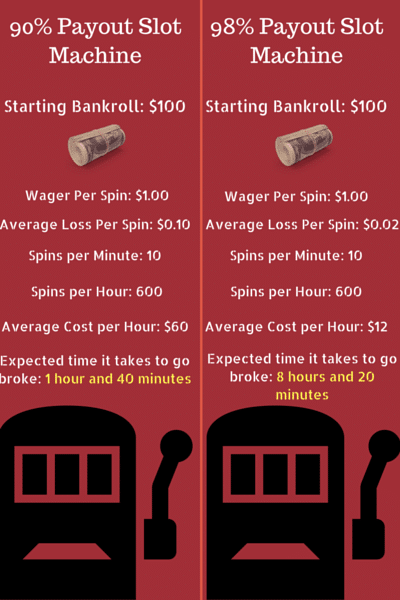 If you lose an average of $0.10 per spin and can spin the slot 600 times per hour, you’re looking at a total cost of $60 per hour. At this rate, your $100 bankroll won’t even last two hours unless you hit a jackpot. Now, let’s instead pretend that you find yourself in the same situation except this time, the slot machine has a 98% payout rate. This means that you’re going to lose $0.02 out of every $1.00 spent on average. At 600 spins per hour, that works out to a total hourly cost of $12 per hour. This gives you over eight hours of play assuming you don’t have exceptionally poor or exceptionally great luck. As you can see, the difference in your average outcome is pretty large even when we’re just talking about an 8% difference in payout rates and relatively small starting bankrolls. Now extrapolate that out to a lifetime of slots play and you can see why the payout rate is so important. Conventional wisdom on the internet is that online slots offer higher payout rates than real world slots because internet casinos can afford to offer better payout rates. They don’t have big buildings to maintain, employees to pay, lawns to mow and so on. That seems to make sense, but is it really true? Let’s find out for ourselves. Before we delve too deep, I should point out that payout rates vary wildly both online and in the real world. These numbers will vary from casino to casino, region to region and country to country. Some online casinos are extremely competitive; others may outright lie about their payout rates. Some regions have laws that regulate the minimum payout rate; some do not. Some casinos are required to publish their payout rates publicly; others may keep it a secret. So with all of that in mind, we’ll be sticking to numbers that come from sources we can trust. The home state of Las Vegas and the original mecca of gambling seems like a good place to start. Nevada state gaming laws enforce a minimum payout rate on all slots of 75% (see page 8 here), but most slots exceed that amount due to the competitive nature of the gambling industry in Nevada. Slots located in the middle of Las Vegas often exceed 90% payout rates because gamblers can easily head to the competition if any one casino’s machines are too tight. The most recent annual report on casino revenue between 1 June 2015 and 31 May 2016 reports the following average payout rates for all slot machines across the state. The thing to remember about Las Vegas is that the payout rates can vary by a huge range from location to location. You will find the best odds anywhere many machines are clustered together. Slots on the Strip and downtown, for example, are usually going to be your best bet because there is just so much competition – gamblers have the advantage whenever there is competition. You should avoid slot machines anywhere there is a captive audience with few options. For example, the slots at McCarran International Airport are notoriously tight. The same goes for slots in out-of-the-way locations such as grocery stores. Casinos located in Atlantic City are required to submit reports each month that detail their financial records for the month. The following figures are from the June 2016 report as published on the website for the New Jersey Division of Gaming Enforcement. Presumably, this means the following figures group games such as video poker in along with traditional slot machines. The inclusion of these other games may throw off the figures a bit, but I doubt it has a huge impact on the payout rates simply because the vast majority of the electronic games at both casinos are just regular old slot machines. Here are the reported payout rates for “video facsimile / slot machines” from July 2015 through May 2016. 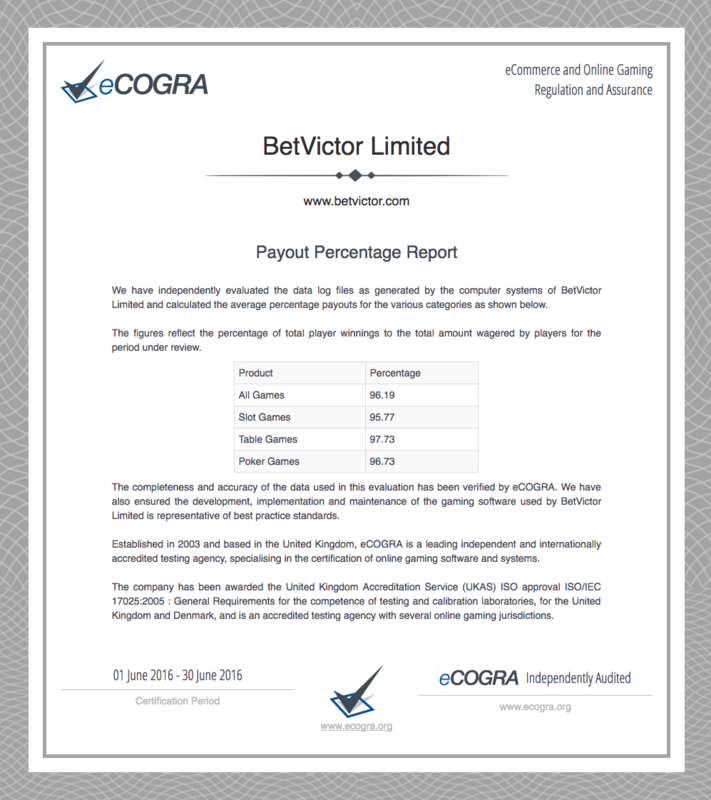 Slot machine payout rates vary greatly in the UK, but the Gambling Commission does not specify a minimum payout rate. It is up to the operators to decide how much they wish to return to players in the form of prizes. However, the UK Gambling Commission does require all slot machines to publish a notice somewhere on the machine that explains the current payout rate. The Genting Group of casinos in the UK advertises a payout rate of 94% on all slots, which is fairly high by real-world standards. We also have unconfirmed reports of slot machines in out-of-the-way places with payout rates as low as 70%. Always verify the payout rate before you play. Anything less than 90% simply isn’t worth your time when there are so many better options out there. So far, we have seen that payout rates in the real world vary wildly. The numbers above are actually fairly optimistic as they come from locations where there are many slot machines operated by competing providers. This tends to push payout rates higher as casinos compete with one another for business. Now we will look at the payout rates for online slots. 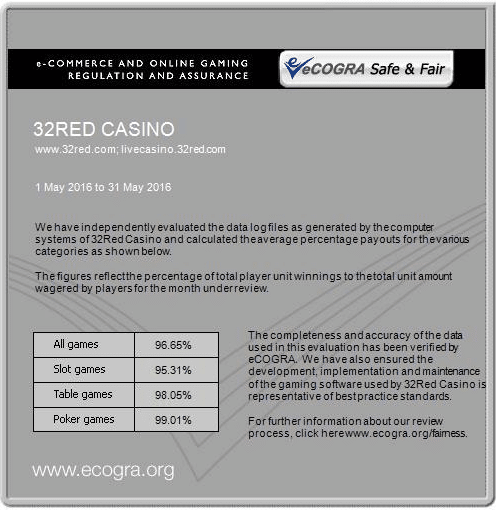 We have to be careful when researching these numbers because many gambling sites are headquartered in countries where regulation is severely lacking. An online casino based in, say, Costa Rica, can claim whatever it wants for payout rates and there is no way to verify that information apart from running a major test over thousands of games. Even then, there are no guarantees that the results you get from such a test will be representative of the payout rate next week, next month or next year given the lack of government oversight in those locations. So, we’ll be sticking to the payout rates as published by casinos that are licensed by the UK Gambling Commission or one of its whitelisted regulators. 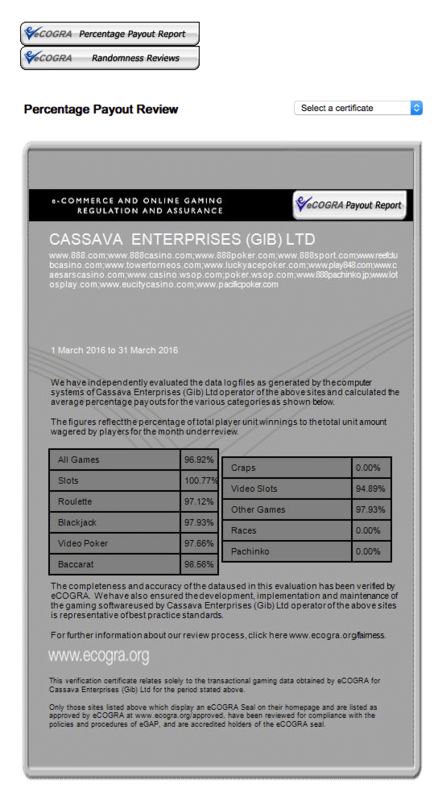 These payout rates are tested by independent companies who specialize in auditing online casinos on behalf of the government. These are all big-name casinos licensed by the UK Gambling Commission so we believe these numbers are reliable. These reports are issued monthly and are calculated based on the previous month’s financial records. It is not recommended that you pick a casino based solely on these reports because there will be fluctuations. Remember, they only cover the previous month’s worth of payouts. All it takes is one big jackpot to skew the results upward for one casino or another over a single month. For example, you can see that 888 Casino paid out more than 100% in March of 2016. That can be explained away with a big jackpot or a good stretch of luck for the players that month. 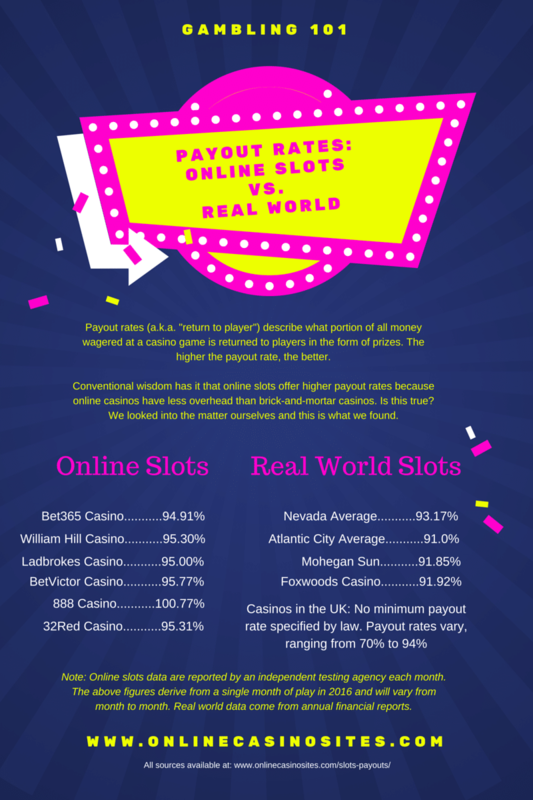 Just look at these figures as general ballpark estimates of what you can expect when you play online at any reputable casino site. Did you find this article interesting? If so, take a look at our previous article detailing the online casinos with the highest payout rates for more recommendations of where to play.